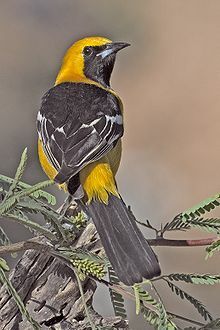 The hooded oriole (Icterus cucullatus) is a medium-sized New World oriole. Adults have a curved bill which is completely black and white wing bars. The adult male has a deep yellowish orange head with black on the face and throat; they are black on the back, wings and tail, orange on the underparts. The adult female is olive-green on the upper parts, yellowish on the breast and belly. Their calls consist of whistling and wheets, while their song is a mixture of both. 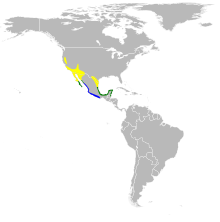 Their breeding habitat is open areas with trees, especially palms, across the Southwestern United States and northern Mexico. The nest is a tightly woven pouch attached to the underside of a leaf or tree branch. Sometimes their nest is filled with the egg of a Brown-headed cowbird which is parasite bird that lays its eggs in other birds nests for that species to take care of. These birds migrate in flocks south to Mexico's southwestern coast; they are permanent residents in Baja California Sur, the Mexican east coast, and Belize. Some may over-winter near feeders. They can also be found in Southern California neighborhoods, but are rare in the winter. They forage in trees and shrubs, also feeding from flowers. It is a nectar robber because it pierces the base of the flower, and does not assist in pollination. These birds mainly eat insects, nectar and fruit, and will also visit hummingbird feeders and bird feeders for seeds. ^ BirdLife International (2012). "Icterus cucullatus". IUCN Red List of Threatened Species. Version 2013.2. International Union for Conservation of Nature. Retrieved 26 November 2013. Bozanich, Clipboard researched by Kathie; Times, Rick VanderKnyff / Los Angeles Times Graphics by Doris Shields / Los Angeles (1989-04-21). "BREEDING BIRDS: HOODED ORIOLE : HOODED ORIOLE (Icterus cucullatus)". Los Angeles Times. ISSN 0458-3035. Retrieved 2016-03-30. "National Geographic Field Guide to the Birds of North America". National Geographic Store (6th ed.). Retrieved 2016-03-30. Pleasants, B. Y., and D. J. Albano. 2001. "Hooded Oriole (Icterus cucullatus)". In The Birds of North America, No. 568 (A. Poole and F. Gill, eds.). The Birds of North America, Inc., Philadelphia, PA.
Betty Boone JL, Lederle PE & Petersen SL. (1999). More additions to the birds of the Nevada Test Site. Western Birds. vol 30, no 4. pp. 211–213. Brown BT & Trosset MW. (1989). Nesting-Habitat Relationships of Riparian Birds Along the Colorado River in Grand Canyon Arizona USA. Southwestern Naturalist. vol 34, no 2. pp. 260–270. Calder WA, III. (1981). Diuresis on the Desert? Effects of Fruit Feeding and Nectar Feeding on the House Finch Carpodacus-Mexicanus and Other Species. Condor. vol 83, no 3. pp. 267–268. Cruden RW & Hermann-Parker SM. (1977). Defense of Feeding Sites by Orioles and Hepatic Tanagers in Mexico. Auk. vol 94, no 3. pp. 594–596. Ellison K & Brush T. (2004). Hooded oriole nest failure associated with a novel nest site. Western Birds. vol 35, no 2. pp. 71–76. Fall BA. (1973). Noteworthy Bird Records from South Texas Kenedy County. Southwestern Naturalist. vol 18, no 2. pp. 244–246. Fisk LH. (1973). Notes on Nectar Feeding by Orioles. Auk. vol 90, no 1. pp. 208–209. Hardy JW. (1970). Duplex Nest Construction by Hooded Oriole Circumvents Cowbird Parasitism. Condor. vol 72, no 4. Leck C. (1974). Further Observations of Nectar Feeding by Orioles. Auk. vol 91, no 1. pp. 162–163. Newman GA. (1974). Recent Bird Records from the Guadalupe Mountains Texas USA. Southwestern Naturalist. vol 19, no 1. pp. 1–7. Powell BF & Steidl RJ. (2002). Habitat selection by riparian songbirds breeding in southern Arizona. Journal of Wildlife Management. vol 66, no 4. pp. 1096–1103. Rasmussen JL & Sealy SG. (2006). Hosts feeding only Brown-headed Cowbird fledglings: where are the host fledglings?. Journal of Field Ornithology. vol 77, no 3. pp. 269–279. Reddall J. (1977). Colorado USA Field Ornithologists Official Records Committee Report 1972 through 1975. Western Birds. vol 7, no 3. Sweet PR, Barrowclough GF, Klicka JT, Montanez-Godoy L & Escalante-Pliego P. (2001). Recolonization of the Flicker and other notes from Isla Guadalupe, Mexico. Western Birds. vol 32, no 1. pp. 71–80. Wikimedia Commons has media related to the hooded oriole. "Hooded oriole media". Internet Bird Collection. This page was last edited on 16 February 2018, at 14:18 (UTC).